Employee Engagement Survey: are expectations fulfilled? 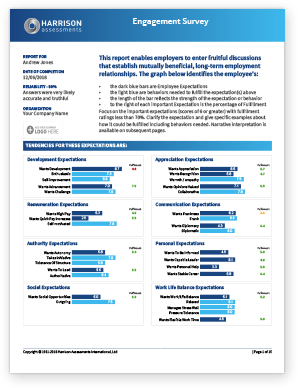 Employee Engagement Survey - Are Employee Expectations Fulfilled? Implications and predictions for future talent retention for specific teams, departments and the entire organization. Track improvement in employee engagement levels to determine improvement for teams or the entire organization. Our Engagement Pulse Check takes less than 5 minutes to complete. Employees who have already completed our SmartQuestionnaire for other talent functions do not need to complete another questionnaire. All the data needed for organizational analytics can be drawn from the SmartQuestionnaire.